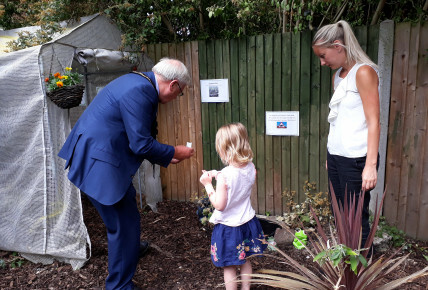 We had a brilliant afternoon with the opening of our nature garden with the mayor attending as our special guest. 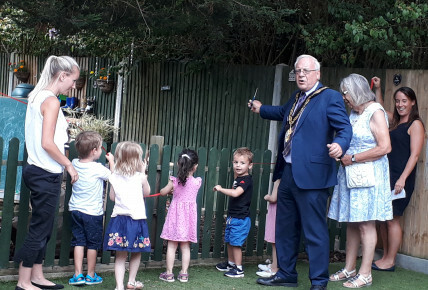 "Epsom Mayor Cllr Neil Dallen opened Busy Bees Childcare’s new garden to celebrate their new outstanding Ofsted rating at their Epsom Treetops nursery. 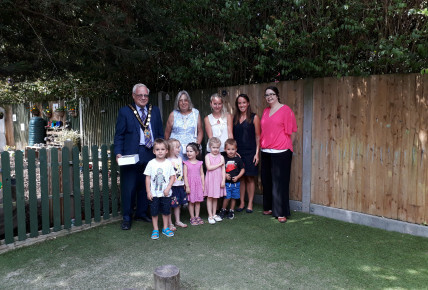 Cllr Neil Dallen and Mrs Ann Dallen read a picture-book to the children and helped them plant wildflower seeds in the garden. Cllr Neil Dallen and his wife received homemade cakes baked by Sam Field from Tip Top Cupcakes decorated with iced mini beasts. Miss Gray, a teacher at the nursery, said: "I am glad the children love nature as much as I do."